I’ve been out of college for twenty years, and probably moved 10 times. I never before remembered a mover’s name or the experience (unless it was bad,which it was frequently). I want to say that within six months, I had to arrange two moves; one for my office (from Brighton to Watertown) and one for my home (from Newton to Needham). I used Mike Bavuso for both, and I COULD NOT HAVE CHOSEN WISER. He is organized, friendly and efficient. He came in on time and under budget in both cases. I could go on about how previous movers have left me in the lurch; taken long, unexplained breaks; given me estimates that don’t reflect the real staff and move-time expectations; had bad attitudes; broken things or otherwise acted with neglect; but why should I? 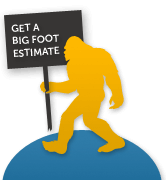 I will only have one mover from now on—Big Foot Moving & Storage. I will recommend Big Foot to anyone who asks and even those who don’t ask. I have already recommended him to two of my office mates (one was my boss) and they were full of the same respect and admiration I had. We all asked ourselves, how is it we got to be adults throughout hundreds of collective moves and have never had such an excellent experience? The answer is probably—no one has ever done it as well as Mike and Big Foot Moving & Storage, Inc. Staggering, but true.